SALE! NORMALLY $190/CASE, NOW $134.95/CASE plus FREE SHIPPING! SALE - Normally $190/case, Now $134.95/case plus FREE SHIPPING! Fasteel Precision Steel 20 guage Waterfowl Shotgun Shells - 3"
We highly recommend these 7/8oz, 1550 FPS shells! These shells are fast yet hold a beautiful pattern. With steel shot.... Speed Kills period. These shells are the best value on the markets for clean burning powerful steel shot shells. We routinely kill big honkers and snow geese with this 20 guage load. 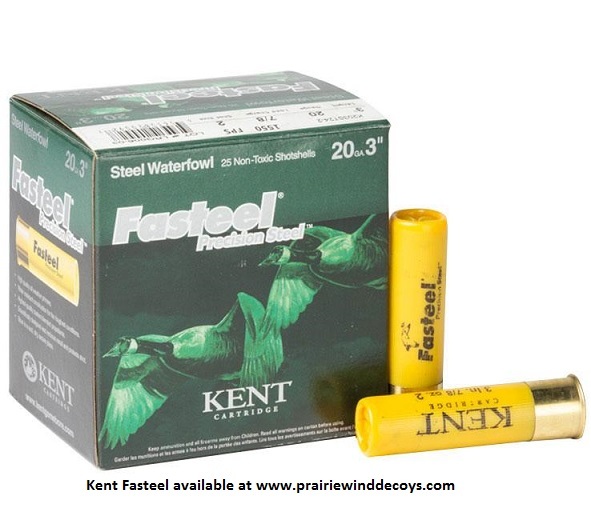 Kent's Fasteel Precision Steel shotshells have proven themselves year after year as the choice for duck and goose hunters across the US, Canada and beyond. Fasteel delivers superior quality and performance at a great value, making it an easy choice for your next hunt. Sold per case = 10 boxes, 25 rounds per box, 250 rounds per case. REGULATIONS ON AMMUNITION SALES - Local rules of sales of shotgun shells can change from time to time. It is important for you, the consumer, to be aware of local regulations that affect your ability to purchase ammunition over the internet. We encourage you to know, be aware of, and be up-to-date on your states regulations. NEW YORK RESIDENTS - We can no longer ship directly to New York residents. FFL LICENSE HOLDERS - We can ship to all FFL License holders in all states. SALE! Normally $190/case, Now $134.95/case! PLUS FREE SHIPPING!